When do World of Hyatt points expire? I receive regular emails from readers asking ‘How can I stop my World of Hyatt points from expiring?’ or ‘When do my World of Hyatt points expire?’. This new series, of which this is the final article, looks at the major hotel loyalty programmes and shows you how to keep valuable points intact. World of Hyatt, previously Hyatt Gold Passport, is the loyalty scheme for Andaz, Grand Hyatt, Hyatt, Hyatt House, Hyatt Place, Hyatt Regency, Hyatt Zilara, Hyatt Ziva and Park Hyatt. If you need to refer to this article in the future, there is a link to it on our ‘Hotel Promos’ page in the World of Hyatt section. This also includes details of current Hyatt promotions. (a) Inactivity. If a Member’s account is inactive for twenty-four (24) consecutive months, all points in that Member’s account will be forfeited at that time, but the Member’s account will remain open (with the ability to earn new points thereafter) unless the Member’s account is otherwise terminated in accordance with these Terms. (Prior to July 1, 2017, Members whose accounts were inactive for twenty-four (24) consecutive months had their membership terminated and all points in and awards or benefits associated with that Member’s account were forfeited upon termination) Under no circumstances will forfeited points be reinstated. Active Members can remain active in the Program by (i) receiving points via authorized means, (ii) receiving credits with a partner in the Program for a stay at a Hyatt hotel or resort, (iii) redeeming points (and, if applicable, completing any reservation for which such points were redeemed), (iv) gifting a Program award (in accordance with these Terms), (v) converting points to Partner Loyalty Points, (vi) purchasing or combining points, or (vii) having a valid Hyatt co-branded credit card associated with the Member’s Program account. If a Member redeems points for an Award Reservation or Oasis Credit Reservation (each as defined in Appendix B) and either cancels that reservation or does not actually check-in on the appointed date (i.e., no-shows), that reservation will not count as a redemption of points pursuant to subsection (iii) of the preceding sentence and will not toll the measurement of that Member’s Program inactivity. Historically Hyatt has been very lax on imposing its expiry rules. Under the new rules above, it is clear that you will lose your points if there has been no activity in the previous 24 months. What do they mean by ‘active’? The key point is that YOU DO NOT NEED TO STAY AT A HOTEL TO KEEP YOUR POINTS ALIVE. You simply need to have some activity go through your account. It is assumed that clause i) “receiving points via authorized means” covers any method of earning points. This is more difficult to achieve with Hyatt than with other chains because it has a limited number of partners. You cannot transfer points from American Express and there is also no Hyatt branded credit card in the UK. What you cannot do to save your points is transfer your points into someone else’s account (or vice versa). Whilst Hyatt DOES let you do this – for free – both accounts must have had some activity in the last 12 months. If you had some activity on your account in the last 12 months, your points would not be about to expire in the first place! The rules I quoted above make it clear than booking and immediately cancelling a reward night does not count as activity. You can often get away with doing this in other programmes. Transfer points into an airline loyalty scheme. The minimum transfer is 5,000 points which gets you 2,000 airline miles, and the transfer will keep the remainder of your points active for another 24 months. Keeping a small amount of Hyatt points alive is not as simple as it could be. There are options, though, so there is no excuse for seeing your account closed down. For an easy life, I would just buy a handful of points and be done with it. If you want to track the expiry dates of all of your miles and points, I recommend signing up to AwardWallet for free. It keeps all of your points balances, including non-travel loyalty schemes, in one place and updates them automatically. If you pay for the premium version it also tracks your expiry dates and emails you when points are about to expire. Really could do with a Credit / Charge Card earning option in the UK. I am surprised Amex have not tapped them up for a MR conversion deal? Rob – any whispers within the industry as to whether this is a possibility? I agree. Ever since they launched their US card the old view that they did not want to ‘devalue’ by seeing a mass influx of points from cardholders no longer holds. Outside the US we are hit by the points inflation caused by the US card but cannot join in ourselves. Indeed Hilton has been most dismissive of the effect on the UK consumer in my chat conversations and we’ve reverted to cash bookings elsewhere in the same casual dismissive manner. Quite a few articles like this one start by saying “I receive regular emails…” – how many emails do you get asking about Hyatt points, or other points’ expirations? Quite a few unmoderated comments on many websites are perceived as gratuitously rude by most readers. Fortunately this is much less true on HfP, which charges readers nothing, has unobtrusive advertising, and a general air of civility. How many users wish that uncivil comments would not be posted on HfP? That would explain it – it seemed unlikely that lots of people were emailing you. I’m glad that has been cleared up; I was really concerned! 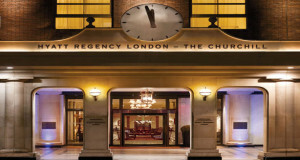 Just stayed in the Park Hyatt in Melbourne via HFP Luxury Hotels referral service. Didn’t get the STA upgrade but everything else worked pretty well. Points + 1k / night promo bonus posted within 48 hours. Would recommend the Hfp referral service and this hotel for best breakfast buffet I’ve had, sharing it with Arnold Schwarzenegger was novel. One last thing….Do you earn standard World if Hyatt points rates and qualifying nights for staying at M Life resorts in Las Vegas?